I did not set out to be writer – and that is not how I see myself, really, but everything has a consequence. Cue and Cut is my fourth and longest book about television production. It’s been a long time in development. It began with a conversation at the University of Sunderland with Trevor Hearing (now at Bournemouth University). That was in 2005. The work there followed some HE teaching in Middlesbrough, which came after three successive years on BBC training courses run for, and in association with, the University of Leeds. This work was a result of teaching aspiring directors at BBC Elstree in 1986-7. That job was itself a result of directing single and multi-camera children’s programmes from 1974 (Jackanory, Jackanory Playhouse and other dramas including Grange Hill). After the stint in Training, I carried on directing at the BBC until 1998, finishing with three series of The Demon Headmaster, and then moving on to work for Carlton and Granada – the freelance projects alternated with the teaching. By the time I started directing Jackanory, I had already spent a lot of time working on various series in Children’s Programmes as an Assistant Floor Manager. In fact, uniquely, so far as I know, my last week working on the floor as an AFM coincided with my first week working in the Gallery as a Director. I ran up and down the stairs a lot. The BBC took me on in the first place (in 1966 – a time of expansion) because I had gained a lot of stage experience as a Medical Student. For a doctor, it was entirely the wrong kind of theatre, so I had given up Medicine. Working in television had been an aim since childhood – particularly since watching David Attenborough on Zoo Quest. More consequences. BBC Television Training commissioned the first two books, Continuity Notes and Television and Children. The third book, Children Acting on Television, was commissioned by A. and C. Black. They had approached my then boss, who found he did not have time to write the book. He suggested me because of the first two BBC books. Consequences, yet again. 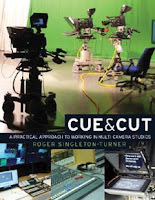 What I hope for Cue and Cut is, firstly, that it will work with practical classes, backing up practical experience and suggesting solutions to challenges. It should, secondly, be a source of basic information and methodology for using multi-camera systems, which are used in some form on around two-thirds of Britain’s most popular television programmes. Finally, I have put in a certain amount of history, an indication in part, of how things got to where we are today and, in part, an indication that the way we do things now is not the only approach! There is enough guidance, I hope, for newcomers to multi-camera techniques to start working in this form, but enough flexibility for readers to soar beyond these basics. I’ll be interested to hear how users find the book works for them. (comments can be sent to the MUP blog).